This film is one of the leaders in the number of music that consists in both parts of soundtrack – only 18 songs considered to be a main collection, while 50 more is additional! This is not surprising for a film that shows the flow of the song contest in Europe, where, in addition to the main songs, dozens of storyline songs poured from the stage to the audience. Vigorous Crazy Youngsters and pretty but slow Flashlight are different. And there are many more such different from each other songs in this collection. 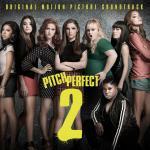 You will be rejoiced with such eminent artists Snoop Dogg and Jessie J , who were attracted to write music for the film Pitch Perfect 2. In general, since the essence of the film is all in energetic dances, and the music is appropriate for the most part, as, for example, Kennedy Center Performance , gratify with its genre. It has been a long time since we heard such a quality musical potpourri, where there was even a place for Wrecking Ball that was a hit of 2014 sung by bright and cheeky Miley Cyrus. There are many music here, it is catchy as the main characters – a dance group, but not as motley as the girls, main characters. In general, it seems that music producers set the task: the more catchy music will be included in the motion picture, the better. Well, if so, then we can totally judge that artists coped with the task at 110% – after listening to the very first 3 or 4 compositions of collection, the body itself starts to dance, hands writes out circles in space, and the legs unstoppably beats the rhythm.